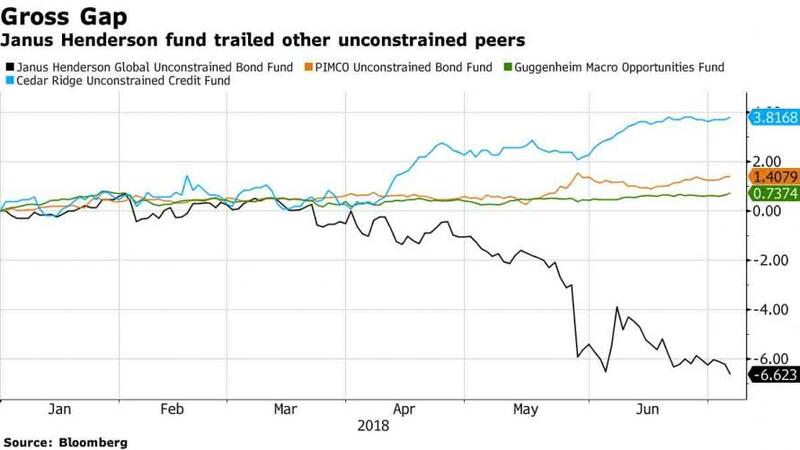 Ever since his acrimonious departure from Pimco in September 2014 (not to mention his messy divorce), former bond king Bill Gross has had a very difficult time rebuilding his reputation - and AUM - and after a series of dismal wrong way bets in the bond market, Bill Gross' Janus Henderson Global Unconstrained fund has seen harrowing redemptions in the first half of the year, amounting to $580 million as a result of the worst performance of his peer group in that period, as the unconstrained fund slumped 6.3% this year through June. Gross’s unconstrained fund, which unlike a traditional bond fund has significant liberty in what to invert relies on derivatives and options-based strategies to generate returns, ranked dead last in first-half performance among 44 peers in its Bloomberg category. According to Bloomberg, June was the fourth straight month of withdrawals for Gross’s bond fund and with AUM tumbling from over $2 billion at the start of the year to just $1.48 billion in June, a quarter of Gross' AUM has been withdrawn by anxious investors in just the past 6 months alone. As a result of sharp losses suffered in May, when Gross had made a wrong short way bet on Treasurys which soared as a result of a record blow out in Italian bonds yields, the fund suffered record outflows of $300 million. One month later, the redemptions slowed down, but only just, and the fund saw another $185 million in outflows. Total assets as of the end of June were down from $1.69 billion a month earlier and a peak of $2.24 billion in February, according to Bloomberg’s data, a catastrophic loss in AUM which puts the very survival of the fund in question. "The strategy has been to be short the German bund and long U.S. Treasuries," Gross explained his underperformance to Bloomberg TV on June 1. "That was the basis for the bad day and the bad trade." However, with 10Y yields refusing to move higher amid fears of a broader trade war, record Treasury shorts - such as Gross - have continued to get pummeled by the relentless flattening of the yield curve. Meanwhile, somewhere Jeff Gundlach - whose DoubleLine fund has also seen its share of pain in 2018 - is smiling.